Implants are an increasingly popular alternative to removable partials. The Mayans are credited with the earliest known example of endosseous implants. While excavating Mayan burial sites in Honduras in 1931, archaeologists found a mandibular fragment dating to approximately 600 AD. This mandible, belonging to a woman in her twenties, had three tooth-shaped pieces of shell placed into the sockets of her missing lower incisors. For 40 years, archaeologists believed the shells were placed after death, in a manner also observed in the ancient Egyptians. However, in 1970, a Brazilian professor named Amadeo Bobbio re-examined the mandible and, after taking a series of radiographs, noted compact bone formation around two of the implants. This discovery led to the conclusion that the implants were placed during the woman’s life and not post-mortem. We offer a full selection of implant options to suit the needs of your patients. Choose from patient-specific custom-milled abutments or stock abutments, or screw-retained, which can be found on our Screw Retained Crown and Bridge & Full Arch page. Our custom milled abutments are available for all major implant systems, including, but not limited to, Dentsply, Hiossen, Nobel Biocare, Straumann, and Zimmer Biomet. We can also accommodate all 3rd party manufacturers. Our custom milled abutments are digitally designed with the ideal buccal-lingual, mesial-distal, and cervical-incisal dimensions based on the surrounding dentition and opposing occlusion. It enables patient-specific solutions for single, multiple, and full arch restorations. If the clinician desires a specific margin location, we can accommodate any such request. Please see the Atlantis image at left. Custom milled abutments more naturally replicate the shape of a prepared tooth, providing a better structure on which the crown or bridge restoration will be fabricated. This achieves a more natural, esthetic result. Custom milled abutments are available in titanium, gold-shaded titanium, or zirconia. Our zirconia milled abutments are affixed to titanium bases. We do not utilize zirconia interfaces. 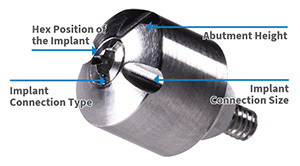 Bellatek Encode abutments are excellent for a less-invasive implant because the healing abutment does not need to be removed and allows for preserving the most natural tissue possible. Conventional impression taking involves the need for repeated dis/re-connections of healing abutments and components during the healing stage. Based on histological observations from a pre-clinical study, these repeated dis/re-connections compromise the mucosal connective tissue attachment to titanium abutments. The Encode design eliminates the need for an impression coping or scan body and therefore reduces abutment swapping to preserve the peri-abutment mucosal sulcus interface. There is only one dis/re-connection required, which is at the time the final custom abutment is installed. The abutments are available in titanium and gold-colored titanium. 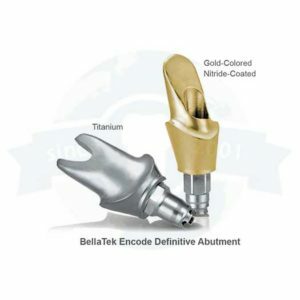 Bellatek Encode healing abutments eliminate the need for an impression coping or scan body. No implant-level impression is required from the dental office, resulting in a simpler and quicker process that also minimizes chair time for your patients The clinician needs only to take a direct impression of the healing abutment, or an Intraoral scan of the healing abutment. Unique markings on the healing abutment provide the necessary information regarding the implant placement. When implant placement allows, and the Doctor instructs for it, we can fabricate any implant case using stock abutments. We have experience with most brands available on the market. Please call with any specific questions related to your next implant case.